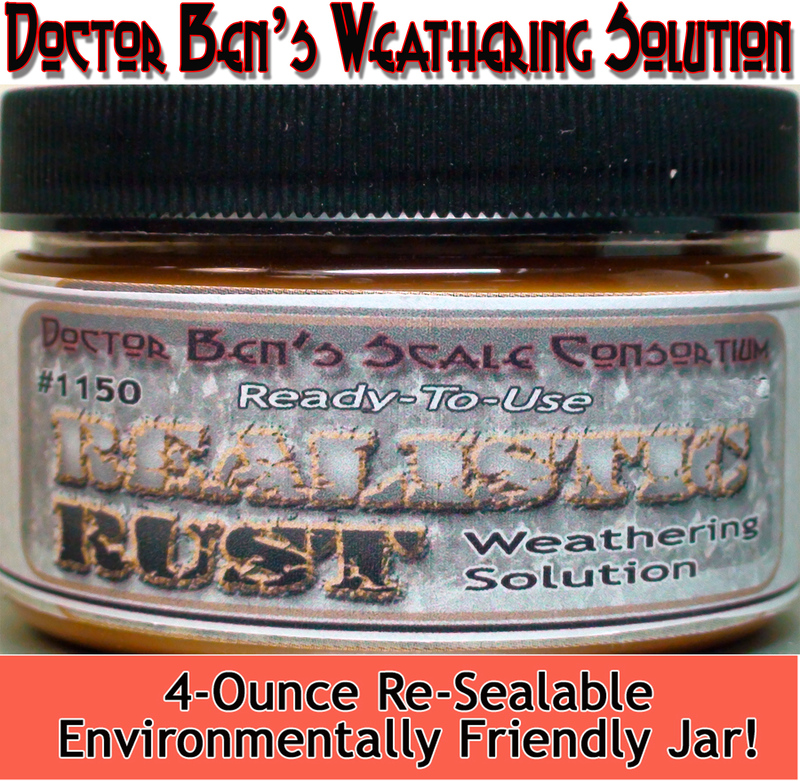 Realistic Rust #1150 Ready-To-Use Weathering Solution for Wood, Plastic, Hydrocal©, Metal & Much More-4oz Jar & 8oz, too! 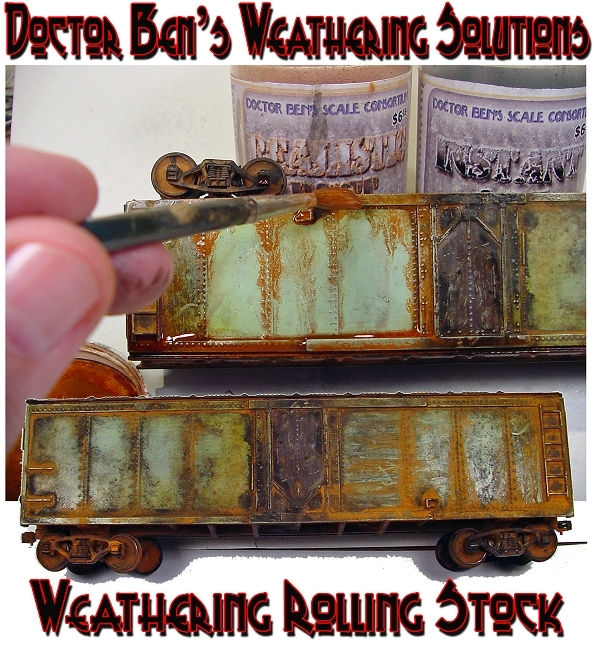 When I first began building Fine Scale Miniatures kits (manufactured by George Sellios) many years ago, the part that I enjoyed the most was the weathering. Nothing irked me more than to build a model in a brand new, pristine condition. I began looking for something more that what the FSM instructions offered. 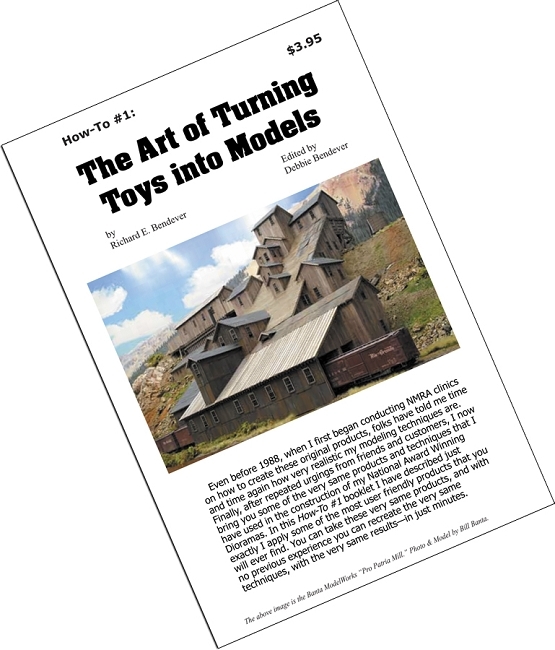 Don't get me wrong, I owe a great deal of what I learned about building models from building early Thomas A. Yorke kits, Model Masterpieces kits, Builders in Scale kits, Timberline kits; heck, there's even a thing or two to learn from building the Campbell kits. 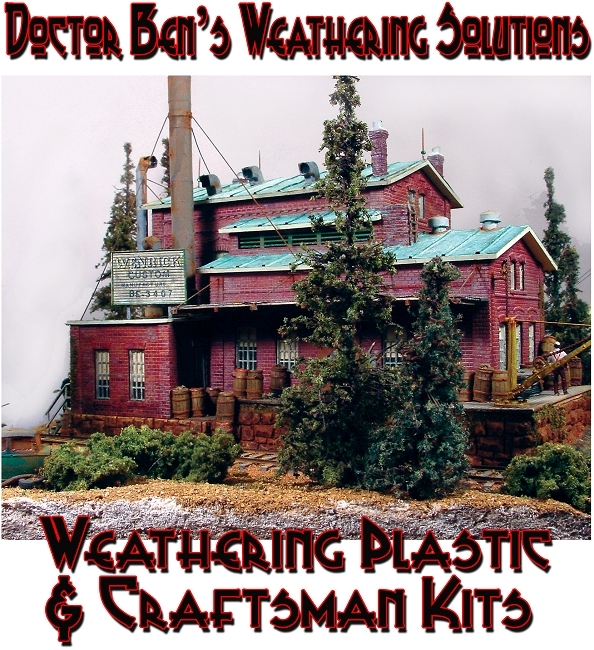 In my quest for the ultimate weathering process I remember that I found a four-step, four bottle product back in the 1980s that stated it came from the guy's driveway and I tried this for a while. I then I tried the 'Steel wool & vinegar rust' process. This I really liked, but the thought of the rusting processing continuing even after the application scared me. I tried flushing with water, but this washed the finer particles away, and I still was not sure that the rusting process had been stopped. I even tried sealing the finish with a dull coat—too labor intensive. And then one day I literally fell over an idea as I was helping my brother install some custom cabinets on a commercial job site. The long story short is that although my formula has changed over the years, AND, a lot of folks have tried real hard to copy my Doctor Be n's products, but they still haven't come close. Several even posed as 'friends' to get the formulas. 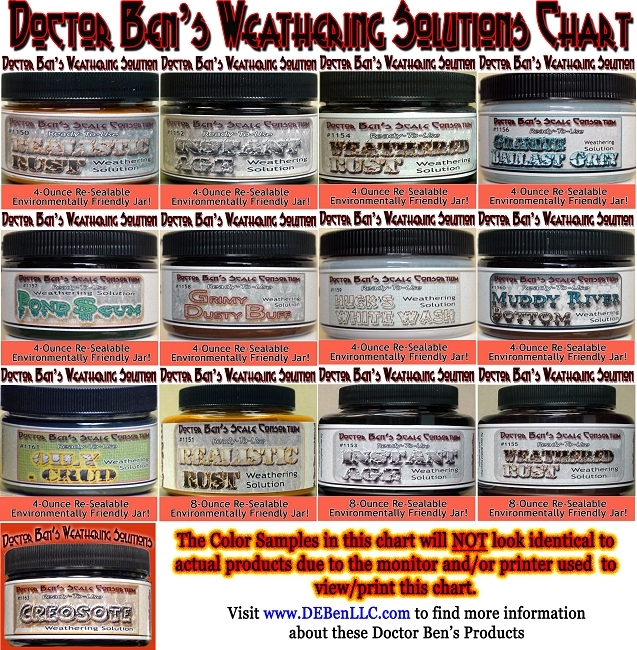 Today, you can buy various weathering powders (NOTE: some are just ground artists chalk and/or tempra finger paint powders), and there are folks are offering stuff used to tint wet concrete (yes, really! 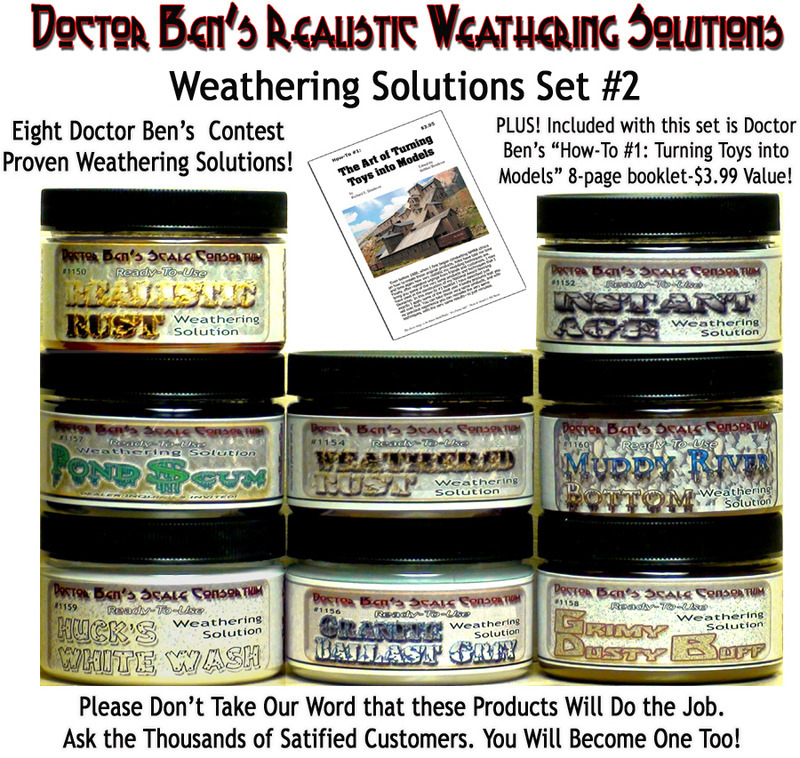 ), but nobody—nope nobody— has a weathering solution OR an industrial weathering pigment that will perform anything like the Doctor Ben's products do. 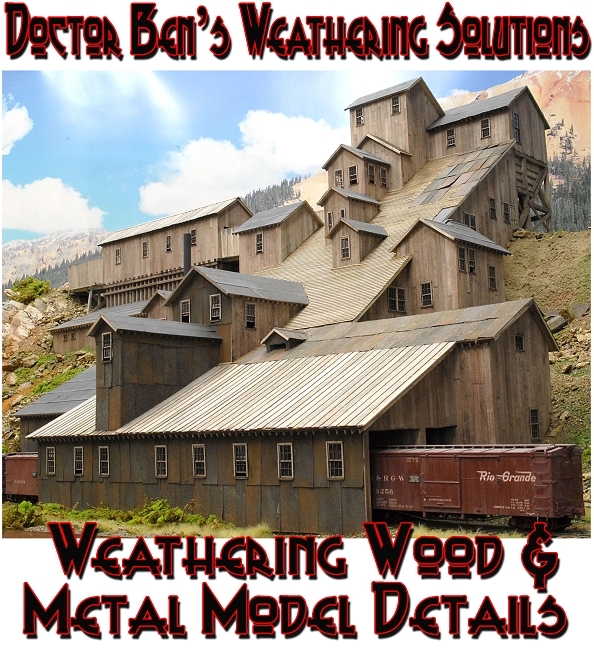 And for the record, these are the very same Weathering Stains & Solutions that I have demonstrated in the many Clinics and Model Shows and used to finish the plethora of Fine Scale Miniatures (FSM), Master Creations, Sequoia Models, Downtown Deco, Thomas Yorke, Scale Structures Ltd, Evergreen Hill Designs, Model Masterpieces Ltd, South River Model Works, and many other kits (including quite a bit of Athearn rolling stock) over the years that have been recognized as award winning, museum quality models. 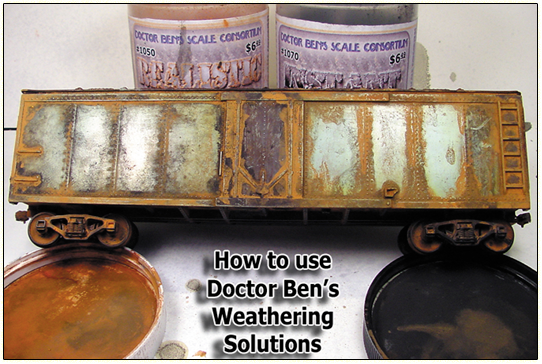 Using this Doctor Ben's Product: I sincerely believe that this is the most Realistic Rust application that you will ever find-guaranteed! Realistic Rust differs from Weathered Rust is more like the rust that you would see metal-on-metal like that sliding steel door scraping on the steel surface or bracing og a boxcar or metal shed—and then dampened by the morning dew slowly etching away at the metal surface. This product is a topical application that does not affect the surface integrity of the model. This product has built in adhesive polymers that enable it to stick to any surface. Get too much on and want to remove it? Not a problem, read on about all the great uses in our How To #1 booklet and in our website Blog.. You will not be disappointed.